Ansari Business Building, Room 102 (first floor). Parking is available in the Brian J. Whalen Parking Complex. A 'quiet events' competition presented by Reno Rubik's Cube Club. This competition will not hold popular events such as Rubik's Cube or 2x2x2 Cube. If you're thinking of coming to this competition as your first competition, we urge you to wait until our regular fall competition in November. Competitors register on this website by creating a WCA account, visiting the "Register" link, and by paying $18.75 via Stripe. Prospective competitors who have trouble with the payment system must contact Reno Rubik's Cube Club to troubleshoot or arrange an alternative method of payment. University of Nevada, Reno students, staff, and faculty are permitted to compete at a discounted rate of $12.50, paid via Stripe. Contrary to regular Reno competitions, this competition will accept no walk-on registrants. There is a competitor limit of 35 competitors. The base registration fee for this competition is $12.50 (United States Dollar). This competition will only hold blindfolded events. This competition will not have regular events like 3x3 and 2x2. If you are looking for a competition with popular events, we urge you to wait until November for Reno Fall 2017. Any competitors who attempt to compete while not being able to solve blindfolded will be disallowed from competing at Reno Fall 2017. The Ansari Business Building is in south central campus, north of the Quad. From Carson City: Take I-580 N/US-395 N for about 30 miles. In Reno, take I-80 W and take Exit 13 for Virginia St.
From Fallon: Take US-50 W to US-50 ALT W for 17 miles. In Fernley, merge onto I-80 BUS E, and soonafter turn left to merge onto I-80 W. Take exit 13 for Virginia St.
From Sacramento: Take I-80 E to Reno for about 130 miles. Take exit 13 for Virginia St.
From UC Berkeley: Take University Ave west to I-580 W / I-80 E. Merge onto I-80 E, pay the toll to cross the Carquinez Bridge, and continue to Reno for about 200 miles. Take exit 13 for Virginia St.
From San Francisco: Cross the Bay Bridge and merge onto I-80 E. Pay the toll to cross the Carquinez Bridge, and continue to Reno for about 200 miles. Take exit 13 for Virginia St.
* Take I-680 N to I-580 E near Dublin/Pleasanton. In Tracy, use the left two lanes to take I-205 E to I-5 N towards Stockton and Sacramento. In Sacramento, take I-80 E to Reno for about 130 miles. Take exit 13 for Virginia St.
* Take I-680 N, pay the toll to cross the Benicia-Martinez Bridge, and merge onto I-80 E in Cordelia towards Fairfield and Sacramento. Continue on I-80 E to Reno for about 175 miles. Take exit 13 for Virginia St. There are several hotels in Reno to choose from, but it should be noted that hotel room rates on weekends at casinos can get very expensive! We recommend using a website like Priceline, Hotels.com, or Kayak to aid in searching for a hotel. 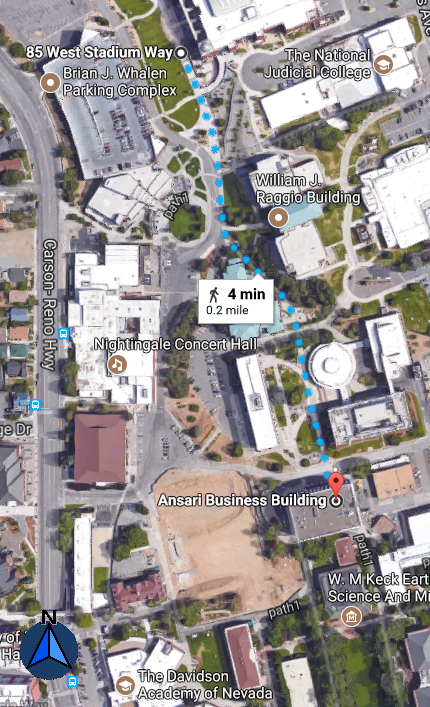 The UNR campus is located just north of Downtown Reno and is easily accessible from I-80. Parking is available in the Brian J. Whalen Parking Structure, accessible from Virginia St. Parking is free on weekends! Due to construction, some walking routes suggested by Google Maps are not possible at this time. * 3x3x3 Blindfolded Round 3 will occur if there is enough time, unanimous consent among the advancing competitors from Round 2, and at least 16 competitors in Round 1. Important: Registration for Please Be Quiet Reno 2017 is separate from registration for FMC Americas 2017. In order to compete in both competitions, competitors must register for both competitions and pay both registration costs.